Topico listens to your Git repository and automatically builds and deploys a version of your app on its own unique testing URL for each new branch or pull request created. You can set environment variables, add HTTP Basic Auth protection, set which ports to serve from and it all runs automatically on SSL. Soon there will be integrations into issue trackers like JIRA so that issues get automatically updated with info about the testing URLs. A Slack integration is also on the roadmap. 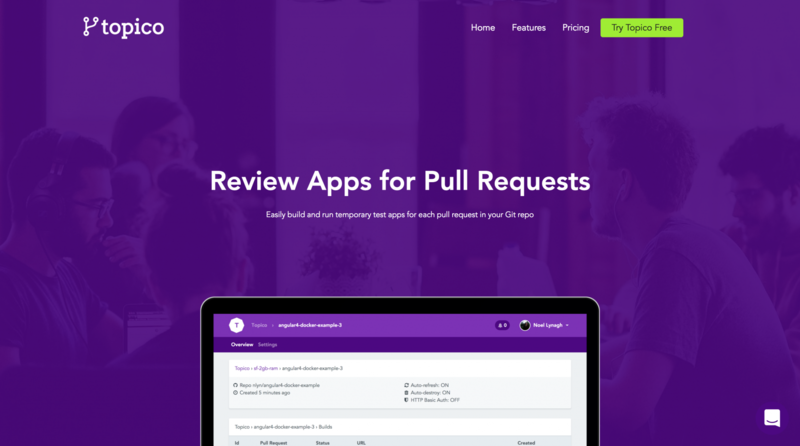 Create a pull request on Github and we'll automatically build & run it. Docker builds are deployed to temporary unique testing URLs. Deploy to your own DigitalOcean account. Create Teams to manage access control to your Organization's resources. Notifies Slack or Hipchat when an environment is deployed or updated. Automatically updates your issue tracking software.